New baby and new home for The Capner Family! 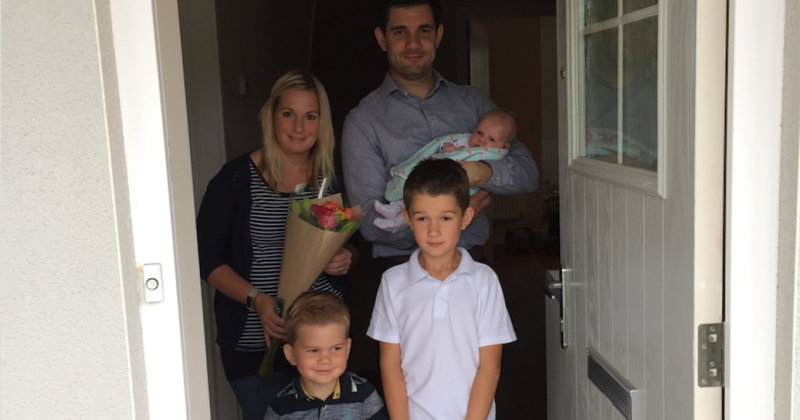 Justin and Kirsty Capner and their young family were very excited for their move to their new family home at Westaway Reach in Barnstaple. Then to add to the excitement, just a day before the house was due to complete, Baby Mya made her grand entrance to the world – just in time for move in day! Moving across Barnstaple for school and work commutes, Justin and wife Kirsty were excited to find a home at Westaway Reach that suited their needs. They chose Devonshire Homes because, having looked at a lot of new homes in the area, they felt they offered a high quality built and a great customer service. Justin said, “We wanted a spacious house with a family-friendly floorplan and communal space to suit the lifestyle we lead. Devonshire Homes offered what we were looking for in a house builder and also in terms of location.